Bedford County Sheriff’s Office was chosen by the National Highway Traffic Safety Administration (NHTSA) to participate in a program to decrease unbelted crashes in Bedford County. In 2016, Bedford County suffered 14 fatalities. Since January 2017, Bedford County has already had 12 fatalities and half of them were unbuckled. This is the highest rate in the entire Roanoke region. 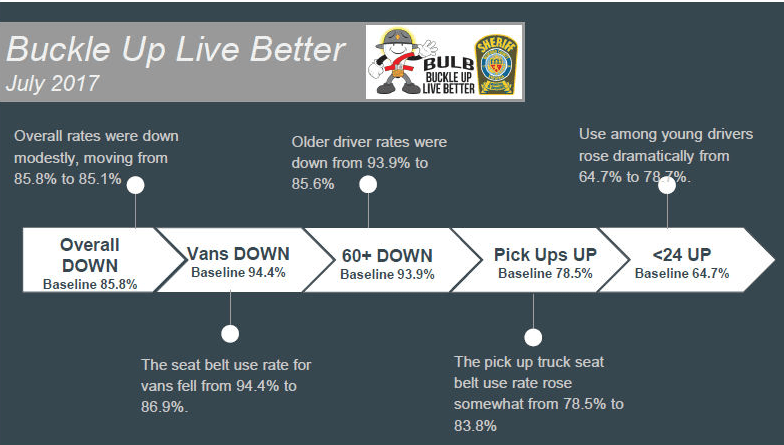 Because of Bedford’s low seat belt usage rate, this campaign has been on-going since August of 2016 and there is some good news to report. Monthly surveys throughout the county have revealed tremendous improvement in numerous categories. We have posted the results below.